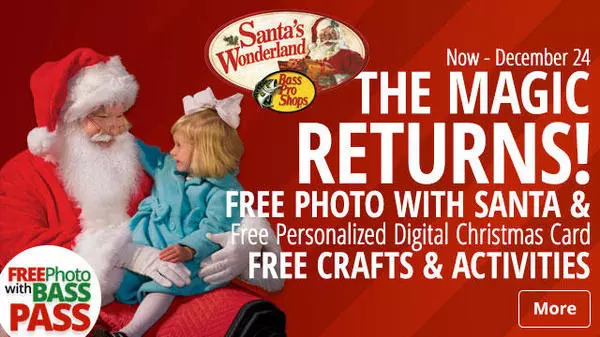 FREE Photo with Santa November 11-December 24, 2017 PLUS FREE Crafts, Games & Activities at Bass Pro Shops! A BASS PASS is REQUIRED to see Santa. To get a Bass Pass, visit the Bass Pass ticket depot in the store. Get a Bass Pass which provides a time slot to see Santa, while allowing you to explore Santa’s Wonderland or shop the store while waiting in a virtual line. Once they are out of Bass Passes for that day, you will have to stop back another day to see Santa. FREE Crafts, Games & Activities in a Magical Wonderland Setting! Please visit basspro.com/santa for the FULL TIME/EVENT SCHEDULE!